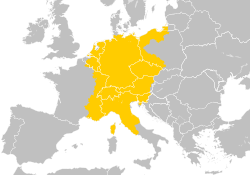 The Holy Roman Empire at its greatest extent in the early to middle 13th century during the Hohenstaufen dynasty (1155–1268) superimposed on modern state borders. The Holy Roman Empire (German: Heiliges Römisches Reich, or in the 15th century: Heiliges Römisches Reich Deutscher Nation) was a group of regions and free cities in central Europe which all came under the rule of an emperor who was elected by the princes and magistrates of the regions and cities within the empire. When Charlemagne died, his Frankish Empire was given to his children and divided into three different countries: West Francia, Lotharingia and East Francia. The Holy Empire started when Otto I of East Francia became emperor in 962, and it was ended by Napoleon in 1806. The emperors claimed to be heirs of Charlemagne and that the Empire dates from 800, when Charlemagne became Frankish Emperor. Until the 13th century, the Holy Roman Empire was powerful. Later, all the duchies and counties inside the Empire started to get more power. At the end, the emperors had little real power anymore, and the country existed only in name. The last emperor abolished the empire in 1806 during the Napoleonic Wars. 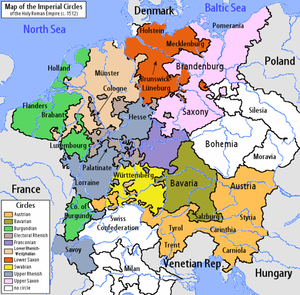 The Holy Roman Empire was not a highly centralized state like most countries today. Instead, it was divided into dozens – eventually hundreds – of individual entities governed by kings, dukes, counts, bishops, abbots, and other rulers. They were collectively known as princes. There were also some areas ruled directly by the Emperor. At no time could the Emperor simply issue decrees and govern autonomously over the Empire. His power was severely restricted by the various local leaders. The Empire was in fact Germanic and not Roman since it was mainly in the regions of present-day Germany and Austria. It was not really holy since after 1530, no emperors were crowned by the Pope; the last being Charles V. It was only really an Empire by name: the territories it covered were mostly independent. The Empire had its own central government and armed forces that acted as one. It was ruled by the House of Habsburg before that fell in 1806. Napoleon forced the emperor to abdicate when France began invading the Holy Roman Empire during the First French Empire. The Emperor made himself emperor of Austria and ended the Holy Roman Empire. The Empire was one of the rare countries in Europe that had an elective monarchy. This meant that the Emperor was chosen by a small group of Prince-electors. Common practice was to just elect the deceased Emperor or Empress 's heir to the throne. ↑ Žůrek, Václav (31 December 2014). "Les langues du roi. Le rôle de la langue dans la communication de propagande dynastique à l'époque de Charles IV". Revue de l'IFHA. Revue de l'Institut français d'histoire en Allemagne (in French). Retrieved 6 April 2016. ↑ John Pike. "Holy Roman Empire - 1500 - The German Empire". ↑ "Reich und Glaubensspaltung, Deutschland 1500-1600". ↑ 5.0 5.1 "Introduction to Global Politics". ↑ 1.0 1.1 1.2 Some historians refer to the beginning of the Holy Roman Empire as 800, with the crowning of Frankish king Charlemagne considered as the first Holy Roman Emperor. Others refer to the beginning as the coronation of Otto I in 962. ↑ German, Low German, Italian, Czech, Polish, Dutch, French, Frisian, Romansh, Slovene, Sorbian, Yiddish and other languages. According to the Golden Bull of 1356 the sons of prince-electors were recommended to learn German, Latin, Italian and Czech. This page was last changed on 22 October 2018, at 16:17.